All good things must come to an end. I say this as three tears stream down my left cheek onto my keyboard. The Shark finished 6th in last weeks NCAA Basketball Fanduel. (Please see results below). This ends a streak of three consecutive top three finishes. But this is not why I am an emotional reck… There is only one more game left of March Madness. Wisco vs. Duke for the title just as JR the Shark predicted (with Wisco winning it all). Say it with me “Frank the Tank, Frank the Tank!” Please take 1 minute and 27 seconds out of your day and enjoy the AP Player of the Year Frank Kaminsky being well, Frank Kaminsky in the video below. The Shark is currently in the 99.2% on ESPN brackets. With all four Final Four teams correct, and the Finals matchup correct, what can’t the Shark do? As the Madness comes to and end, JR the Shark will be providing lineups for NBA and NHL. As you know it is difficult for me to take the NBA regular season seriously. This week I will lock in a Fanduel lineup for the NHL games. This is my first time locking in an NHL lineup, so bare with me. Please see the Fanduel scoring format below. Hit-or-Miss- My first NHL Fanduel observation is that most players either do very well or do not perform at all. There is very little middle ground. I preach consistency. If there is any at all, I WILL find it. Negatives- Additionally, there is a very likely possibility of scoring in the negatives. In fact, every player I analyzed this week has scored in the negatives at least once this season. Minutes- I will use similar strategies as seen in NCAA Basketball Fanduel. Minutes played is always important because the more time a player spends on the ice, the more opportunities they will have to perform. Goals and Goalies- Goals are obviously the most important stat line in Fanduel. Look for players that are shooters. It is important to analyze how many shots are taken by each player and who finds the net. Additionally, goalies CAN AND WILL put your team on their backs. Find a goalie with a great matchup and roll with him. BIG Names- After looking at the players listed this week it appears that the Fanduel analytics team raises the prices on big name players. Take your time and look through the list. A lot of players get ice time and there are many potential sleepers. Injuries and Time Off- Make sure the player selected is actually playing that night. Injuries in the NHL are common and a player can receive a night off at any moment, especially with the playoffs rapidly approaching. The guy has been hot as of late. He has performed, and performed well in his last four games. I like him at home tonight. He was taken as a salary cap reliever. Pulkkinen is a young player with talent. I am not expecting a multiple goal performance. But, I like Detroit to win this game and believe he will have a positive plus/minus differential. Chi-Town. I am a Rangers fan but I think Chicago is one of the teams to beat. Look for them to stay hot as the playoffs approaches and they have won 4 in a row. Hossa has been around for a while and shines in the bigger moments. USA! USA! Many of you may remember Oshie from the 2014 Winter Olympics. He has been described as an American hero. This was not an anomaly, he is actually a pretty solid NHL player. He is an assist king and is playing his best hockey right now. Hes scored a goal in 4 of the last 5 games for the Blackhawks. He plays a lot of minutes and will score tonight. Just so gritty. This guy is a defender that does it all. He can score, and is constantly all over the ice. He’s a phantom. I like the Canadians tonight so I went with the whole package. 2 defenders, and the goalie. I think there is the possibility of a shutout with a banged up Panthers team. Shutout alert! This is a big game for the Canadians and I think they will respond. I splurged on Price so I hope he’s worth it. *Steal of the Night. Aleksander Barkov. 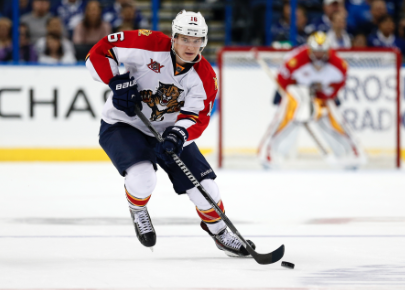 With the season ending back injury to Nick Bjugstad last week, the 19-year-old Barkov will have a great opportunity to shine. I think he will see the puck a lot and have some great chances in this one. Alexander Ovechkin. At $9,800 he will be the scrub of the week. I do not like Washington at Detroit this week. I did not take one player on the Capitals as I think the Red Wings will win in a blowout. Ovechkin is coming off a shaky performance against Ottawa and I believe he will have another bust night.